Scientists at Caltech have confirmed the distance of the furthest galaxy known in the Universe as of today. The light from this very early celestial comes just 570 million years after the Big Bang. Keep in mind that the Universe is 13.82 billion years old. 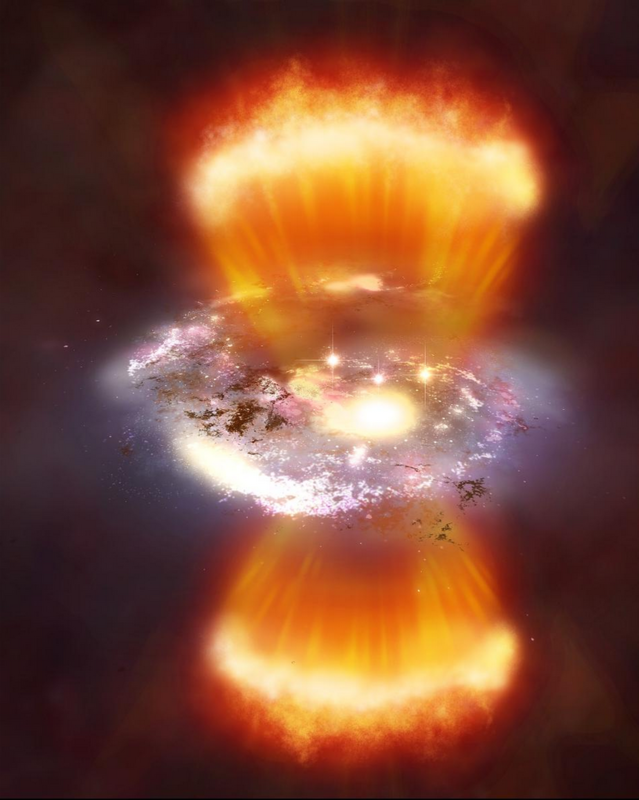 The previou record holder formed much later: 2.2 billion years after the Big Bang. Astrophysicist Adi Zitrin led a groups of scientists in confirming the distance to EGSY-2008532660, as it has been unceremoniously called. 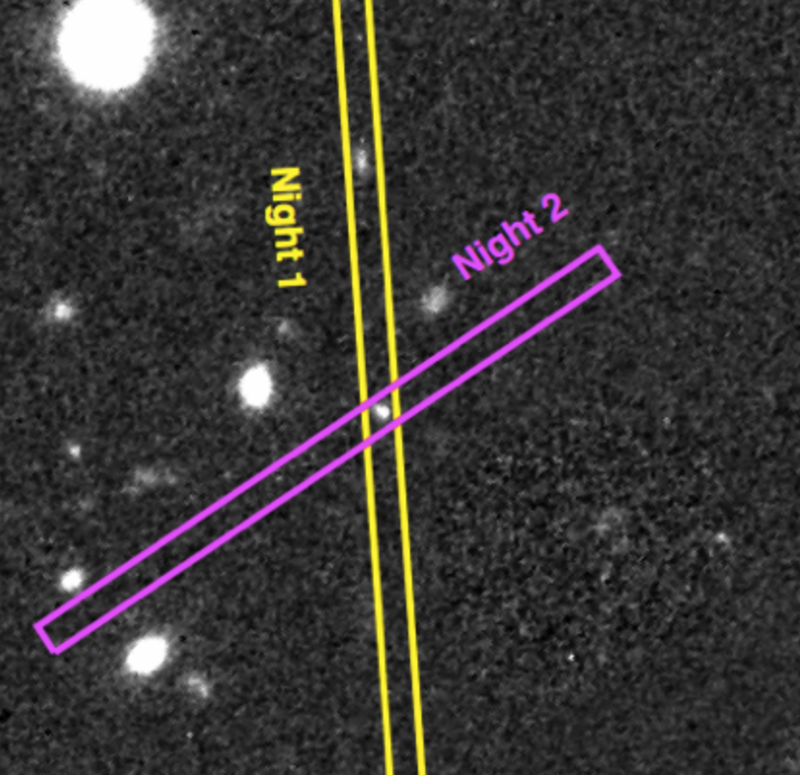 Previously reported by Guido Roberts-Bersani at University College London, it was previously a mere candidate for a distant object. Figure 1. An illustration of a Lyman Alpha (ultraviolet) emitting galaxy in the early Universe. Credit: M. Weiss. Astronomers use light from objects to determine several of their characteristics: mass, chemical composition, rate of star formation, distance, among others. 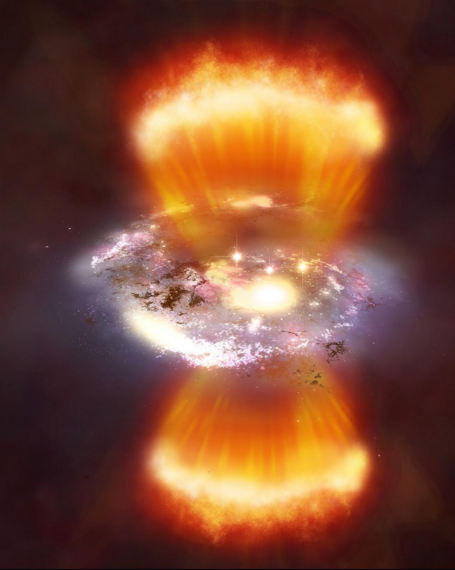 Young stars that reside in galaxies in the early universe emit a lot of ultraviolet light that is released into outer space and travels in all directions. Now, most telescope instruments do not work best with ultraviolet light. Fortunately for us, the universe is expanding in an accelerated manner and objects are receding from us. The farther away they are, the faster they move away from us, a phenomenon known as the Hubble Law. Objects receding from us change how their energy arrives to us. Ambulances, for example, change their pitch when coming closer or away from us, something known as the Doppler effect. Galaxies moving away from us look redder (are red-shifted), therefore showing their original blueish ultraviolet light as reddish to us. Instruments like the Hubble Space Telescope and the Keck Observatory in Hawaii are very sensitive in red. If we can detect this very peculiar UV-light signature from stars that make up early galaxies, we can determine how much it has red-shifted. This is a direct measurement of its receding velocity and therefore of its distance. Zitrin's team has used the Keck Telescope in Hawaii to study this peculiar light signature from EGSY-2008532660, placing it, without doubt, at a time 570 million years after the Big Bang, that is, very early in the Universe when we consider that it is presently 13.82 billion years old. Other than the redshifting, the discovery of such distant, early and therefore small and dim galaxies, requires additional aids for their detection. This is where mother nature comes in. Initially suggested by Orest Chwolson in 1924, gravitational lensing is a natural phenomena that bends space and time. Created by any object with sufficient density (certain mass within a certain area), it is most easily found in groups of hundreds of galaxies known as galaxy clusters. This bending by the cluster's mass (the object in the foreground) magnifies the signature from an object in the background, which can be another galaxy, a bright galaxy nucleus (quasar), another star, you name it. So the light of very dim and distant objects in the background that would otherwise be missed, is actually amplified and detected when telescopes point to these clusters of galaxies. Therefore, we have a double system of magnification: our telescopes point toward massive structures in the universe that are also magnifying through gravitational lensing what lies precisely behind them. The study suggests that EGSY-2008532660's light is being amplified almost two fold, making it easier to detect despite its distance and size. Figure 2. 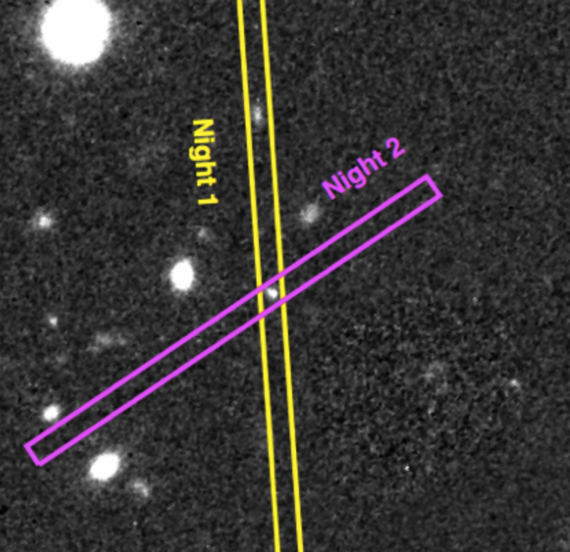 Galaxy EGSY-2008532660 is seen in the crossing of two colored bars that show where the telescope was pointed at. The image was taken by the Hubble Space Telescope and is directly taken from the published article by Zitrin, et al., 2015. We can only expect to see more of these very remote galaxies as more observations are carried out through huge telescopes, techniques are refined and astronomers develop better computer algorithms to detect and study them. Every month or so we hear of the farthest galaxy discovered yet, but this one, in particular, has broken the record by far. You can find the scientific article here [arXiv].